In earlier tutorials you learned how to update data. This tutorial shows how to use optimistic concurrency to handle conflicts when multiple users update the same entity at the same time. You change the web pages that work with the Department entity so that they handle concurrency errors. The following illustrations show the Edit and Delete pages, including some messages that are displayed if a concurrency conflict occurs. The alternative to pessimistic concurrency is optimistic concurrency. Optimistic concurrency means allowing concurrency conflicts to happen, and then reacting appropriately if they do. For example, John runs the Departments Edit page, changes the Budget amount for the English department from $350,000.00 to $0.00. Before John clicks Save, Jane runs the same page and changes the Start Date field from 9/1/2007 to 8/8/2013. You can keep track of which property a user has modified and update only the corresponding columns in the database. In the example scenario, no data would be lost, because different properties were updated by the two users. The next time someone browses the English department, they'll see both John's and Jane's changes — a start date of 8/8/2013 and a budget of Zero dollars. You can let Jane's change overwrite John's change. The next time someone browses the English department, they'll see 8/8/2013 and the restored $350,000.00 value. This is called a Client Wins or Last in Wins scenario. (All values from the client take precedence over what's in the data store.) As noted in the introduction to this section, if you don't do any coding for concurrency handling, this will happen automatically. In the database table, include a tracking column that can be used to determine when a row has been changed. You can then configure the Entity Framework to include that column in the Where clause of SQL Update or Delete commands. The data type of the tracking column is typically rowversion. The rowversion value is a sequential number that's incremented each time the row is updated. In an Update or Delete command, the Where clause includes the original value of the tracking column (the original row version). If the row being updated has been changed by another user, the value in the rowversion column is different than the original value, so the Update or Delete statement can't find the row to update because of the Where clause. When the Entity Framework finds that no rows have been updated by the Update or Delete command (that is, when the number of affected rows is zero), it interprets that as a concurrency conflict. In the DepartmentController.cs file, change all four occurrences of "LastName" to "FullName" so that the department administrator drop-down lists will contain the full name of the instructor rather than just the last name. ModelState.AddModelError(string.Empty, "The record you attempted to edit "
+ "was modified by another user after you got the original value. The "
+ "edit operation was canceled and the current values in the database "
+ "have been displayed. If you still want to edit this record, click "
If the FindAsync method returns null, the department was deleted by another user. 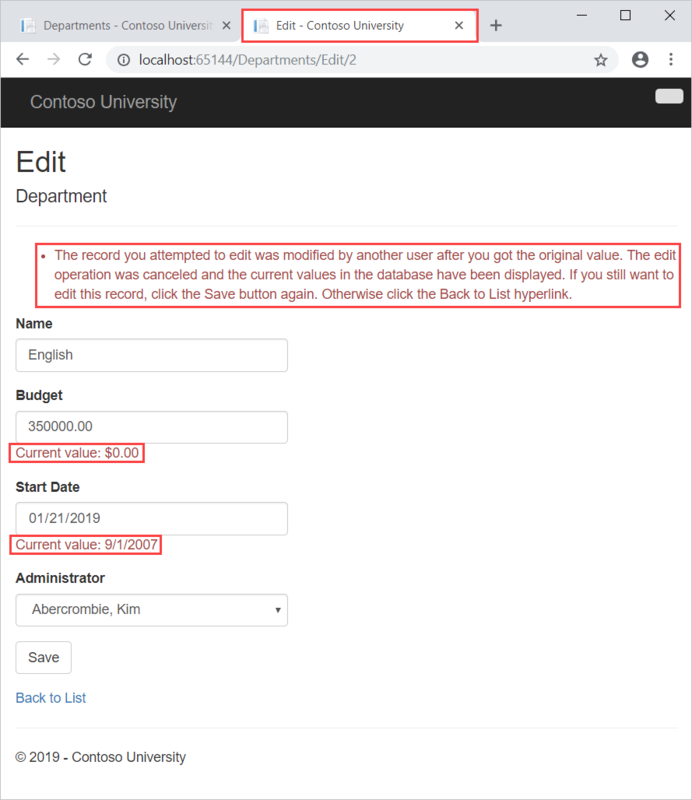 The code shown uses the posted form values to create a department entity so that the Edit page can be redisplayed with an error message. 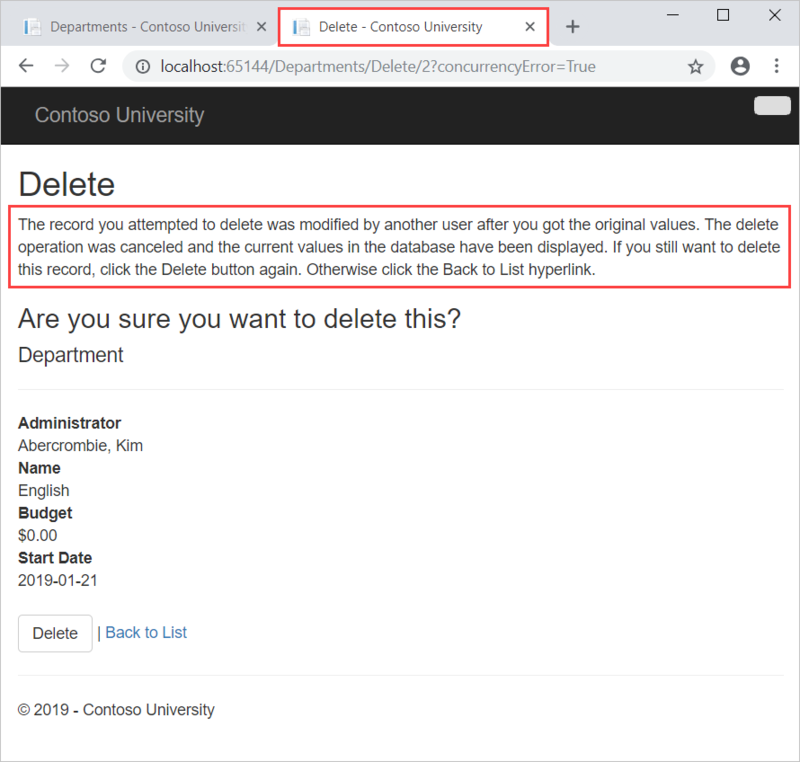 As an alternative, you wouldn't have to re-create the department entity if you display only an error message without redisplaying the department fields. The view stores the original RowVersion value in a hidden field, and the method receives it in the rowVersion parameter. Before you call SaveChanges, you have to put that original RowVersion property value in the OriginalValues collection for the entity. Then when the Entity Framework creates a SQL UPDATE command, that command will include a WHERE clause that looks for a row that has the original RowVersion value. + "was modified by another user after you got the original value. The"
Run the site and click Departments. ViewBag.ConcurrencyErrorMessage = "The record you attempted to delete "
+ "was modified by another user after you got the original values. " + "The delete operation was canceled and the current values in the "
+ "database have been displayed. If you still want to delete this "
+ "record, click the Delete button again. Otherwise "
//Log the error (uncomment dex variable name after DataException and add a line here to write a log. In Views\Department\Delete.cshtml, replace the scaffolded code with the following code that adds an error message field and hidden fields for the DepartmentID and RowVersion properties. The changes are highlighted. In the first window, change one of the values, and click Save. Links to other Entity Framework resources can be found in the ASP.NET Data Access - Recommended Resources. For information about other ways to handle various concurrency scenarios, see Optimistic Concurrency Patterns and Working with Property Values on MSDN. The next tutorial shows how to implement table-per-hierarchy inheritance for the Instructor and Student entities. Advance to the next article to learn how to implement inheritance in the data model.